The rugged island is famous for its maquis, the herby vegetation that covers the hillsides where resistance fighters hid during the Second World War. The herbs are still an essential element of everyday cooking on Corsica. 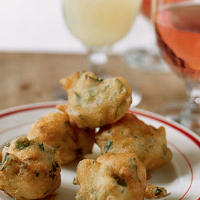 One of the most popular dishes is these little herb fritters (known as fritelles), which are served as an accompaniment to aperitifs. Make a batter by sifting the flour with a pinch of salt into a bowl. Make a well in the centre of the flour and slowly stir in the egg yolk and the olive oil. Stir in the iced water in a steady stream. Cover with a clean tea towel; leave to stand for at least an hour. When you are ready to cook the fritters, fill a pan one third full of the groundnut or sunflower oil and heat to 180°C (the point at which a cube of bread takes 40 seconds to brown). Add the chopped herbs to the batter, then whisk the egg white to soft peaks and gently fold into the batter. To cook the fritters, drop tablespoons of batter into the hot oil and fry in batches for 5 minutes, turning halfway through, until golden. Drain the fritters on kitchen paper and serve piping hot. So what’s the aperitif to be? Try intensifying the flavours of wild plants with a complex, classic southern French vermouth.